Spring has firmly been established for over a week now, with Yellow-rumped Warblers singing, Violet-green and Tree Swallows darting over lakes, and the whir of Rufous Hummingbird wings. If I'm in Victoria and these sights and sounds are all around, I know it's time to hit open areas to look for Mountain Bluebirds and my nemesis grail Say's Phoebe. Say's Phoebe has a predictable spring passage window, much more so than the fall, but where it shows up is the hard part. There is an abundance of open areas, so you're left with checking ones that traditionally turn up Mountain Bluebirds and have had Say's Phoebe records in the past or else just crossing your fingers and hoping the stars align. On Saturday, March 29, the stars aligned in all sorts of ways. I probably earned some karma points by dropping off "A Bird-Finding Guide to Mexico" to Jeremy K. bright and early in the morning. I forgot he was taking off that day to Vancouver to stay the night before flying off to Cancun, so it was probably a nice surprise for him when I showed up at his door with the guide in the morning. I was just going to stay on the Saanich Peninsula, but I opted to do my Metchosin run since I was already out in Colwood. I took the Veterans Memorial Parkway and then turned on to Latoria Rd., which cuts through the old gravel pits. This area had a Mountain Bluebird a few weeks ago, so I figured I would check all fences, posts, wires, and other assorted perches as I made my way to Metchosin Rd. 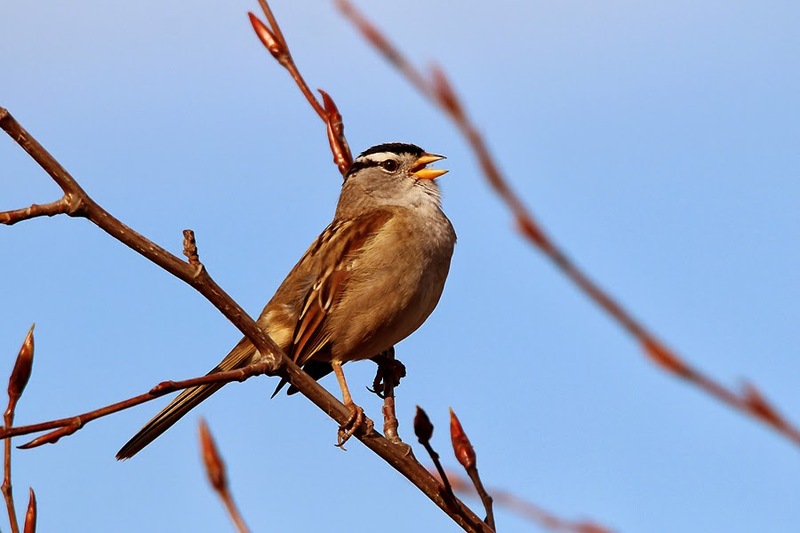 The first bird that stood out was a singing White-crowned Sparrow, which I decided to stop and photograph. White-crowned Sparrow announcing its presence: "Oooh-eee cheddar cheddar cheese!" As I walked back to hop in the car, I was serenaded by the song of a Western Meadowlark sitting on top of one of the hydro poles. I got in the car and continued rolling along down Latoria Rd. and then promptly pulled back off to the side of the road. A bird was sitting on a powerline on the north side of the road and my initial thought was that it was perhaps the same Mountain Bluebird from a few weeks ago and it had just eluded detection. A look through the binoculars pushed that thought aside and after some mental contortion, I was nervously excited at the prospect of it being a Say's Phoebe. The bird then did some aerial acrobatics before landed on a large rock, revealing a perfect profile view of a Say's Phoebe! The pale ashy upper parts and ochre-washed belly were radiant in the morning sun. I sprang into action with my camera and the bird was quite obliging. A mound of dead broom was one of the favoured spots of the phoebe in the morning and it also provided a visually attractive perch for photos. 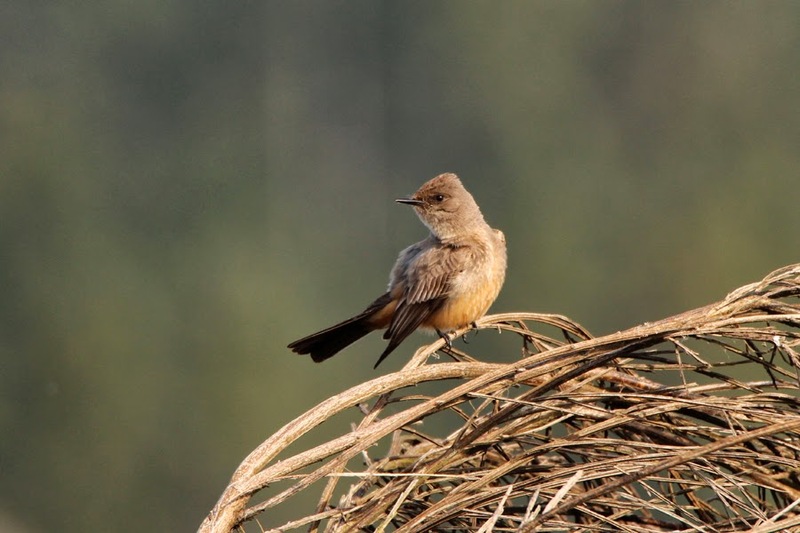 A shot of my freshly conquered nemesis bird: the Say's Phoebe! The stars had aligned and I had knocked down a major Victoria nemesis bird! Now I had a new dilemma. 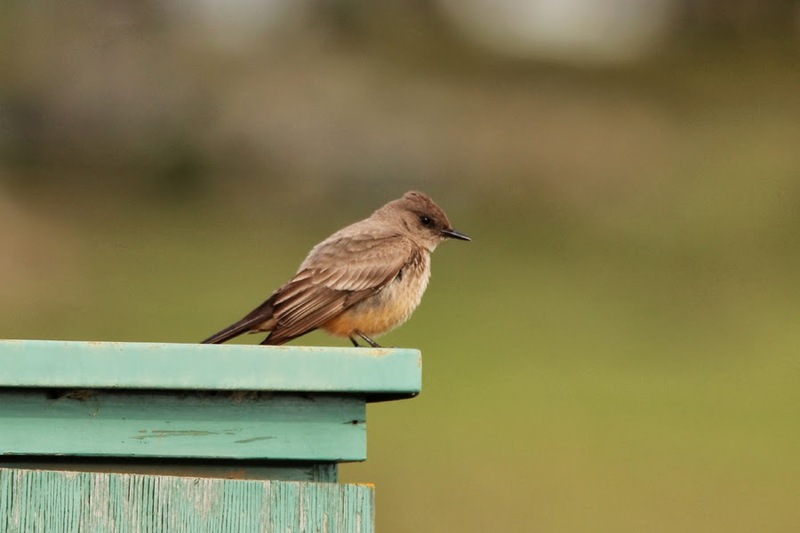 How do I spread the word about the Say's Phoebe? I currently don't own a cell phone and I was a long ways from home. My mind raced with all sorts of options. Should I head back to Jeremy K.'s place and get Thea to contact him at work? That didn't seem like a great option, so I thought I would try heading to Eastern Phoebe spot and hopefully I would find a birder with a cell phone there. Well, connecting with the Say's apparently didn't drain all my karma and I miraculously found Rob Gowan just around the corner. He was looking for a Mountain Bluebird that had, unbeknownst to me, been reported a couple days earlier. Rob was turning around and heading towards Latoria Rd., but I didn't want to chance anything. I hurriedly pulled off to the side, jumped out, and ran down the road like a crazy person, waving my arms trying to get his attention. It worked! We drove back on to Latoria and I pulled off a short distance from where I had last seen the phoebe. We quickly found it and then we decided we should get our cameras. More photos were taken, and here is one. Say's Phoebes have subdued colours but the warmth of that ochre belly make them a subtly attractive bird. While trying to follow the Say's Phoebe as it moved around, Rob spotted a couple of Mountain Bluebirds on the south side of the road. I looked over and realized there was actually three, then four, then five... and finally, six Mountain Bluebirds! Two of the bluebirds were impossibly bright males. For some reason, I decided to stop taking photos at this point, so I have no shots of the bluebirds. At any rate, it wasn't long before the message that Rob had spread to BCVIBIRDS had birders dropping everything to come out for a slice of the interior. First it was Heather Trondsen, then Cathy O'Connor, and finally Gordon Hart. I sincerely enjoy meeting new birders and reconnecting with others I haven't seen in a while, so I enjoyed getting to share the phoebe with four birders in short order. Just before noon, I decided I better head back home because I was going to get out for more birding in the early afternoon with Ian Cruickshank and Avery Bartels. I had never met Avery but had heard nothing but good things, so it was great to finally meet and go birding with him and Ian. We started with a quick check over Maber Flats before Ian started getting a little antsy about the Say's Phoebe and Mountain Bluebirds. We made our way back out to gravel pits and as we pulled up to the area, we saw Mike and Barb McGrenere. We figured if the phoebe was still around, they would know roughly where to look. We got the encouraging word that it was there a couple minutes earlier and it wasn't long before Barb spotted it on a wire. As we were switching our focus between the phoebe and the bluebirds, I noticed a bird in a patch of broom that had white corners to its tail. That was really all I got on it, but it was tantalizing enough that we stayed trained on the area. Soon, Avery proclaimed that it was a Palm Warbler! The bird proved to be quite tricky to get good looks at, but eventually we all had decent views. A second wave of birders poured in at this point. First, Cathy Carlson pulled up and we quickly got her on the Say's Phoebe. She let me know that she was very excited and thankful that I got the word out because the phoebe was a lifer for her! Those are the kind of words that make my day! Next, the Newell clan emerged from a car and we were able to show them the two stars, but the Palm Warbler was not showing any more. No bother... an immature Golden Eagle rose up and put on an incredible show! We watched the Golden Eagle casually soar back and forth against a backdrop of trees on the south side of Latoria, showing off its white tail base and pale flashes on the wings every time it banked. As if getting to watch the eagle soaring around wasn't enough, it landed on a rock ledge and all scopes were focused on it. The golden nape is a feature I rarely get to see because I usually see Golden Eagles soaring, so this was incredible! We were then joined by Cathy Reader and Rebecca Reader-Lee and efforts were then focused on getting them on all of the birds. It was starting to seem customary to find a new bird with each new addition to the birding fleet, so I decided to check an intriguing grey bird sitting up on some very distant broom. The bird had a tall profile and I really thought it had to be a Townsend's Solitaire. I got Ian to check the bird and he agreed - the micro Patagonia Picnic Table Effect was strong on this day! I also got Cathy Carlson on the bird and Avery seemed to just get a glimpse of it with binoculars before we lost its exact location. The solitaire was spotted when it next flew, but it ended up behind a patch of broom. I was focusing on where it was going to go next and then an American Robin hopped out of the broom. Did both Ian and I greatly misinterpret the bird based on the distance and angle? "There's the solitarie!" someone excitedly called out. The Townsend's Solitaire sat up on dead mullein stems long enough for everyone to get decent views. Unfortunately, Heather Trondsen came back just a little too late for the solitaire - it was all a blur, so perhaps that's not true - but she was able to get more great looks at the bluebirds and see the Golden Eagle in action, too. What a great gathering of birds and birders in one place! The afternoon session at the Latoria gravel pits was one of the greatest birding moments for me in recent memory. The combination of five uncommon to rare species, the number of birders in attendance, and just the amount of fun everyone was having made this event the perfect kickoff to spring. Thanks to everyone who came out to enjoy the spectacle! Great blog post, Jeremy. What an incredible find. It was really great to meet you. My thanks to you for pointing out the location of both the Say's Phoebe and 2 of the bluebirds! This is a very interesting blog. I very like your posted article. You have explained very nicely your spirit. Thanks, Jacob! I have been camera-less for a couple months, but I just got the 7D Mark II and I should be putting out material again as a result. Hopefully some newer posts will also be of interest to you.